Having a personal English Dictionary in a basic need in every computer . But unfortunately almost all dictionaries available Today are payed versions or sharewares .WordWeb 5.52 is a free International English dictionary that offers so many features that even payed dictionaries don’t have .WordWeb 5.52 dictionary is completely offline with definitions for around 150000 English words and synonyms .Download WordWeb 5.52 free English dictionary ,free English Dictionary for Windows . Apart from the default dictionary search , WordWeb 5.52 also has a correcting mechanism that displays identical words,types for misspelled entries . Hear pronunciation of search terms . 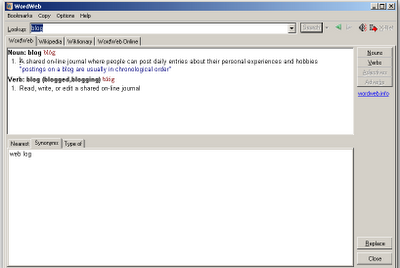 Get details of word /search term via , Wikipedia ,Wikictionary and Web word online . Access dictionary in any program by selecting and using shortcut key Ctrl+Alt+W ,which can be set as per the user requirements . Download WordWeb 5.52 Free English Dictionary for Windows . Related :Download spell checker for Windows .